Povidone-iodine, also known as PVPI, is a water-soluble complex of iodine, having polyvinylpyrrolidone (PVP). 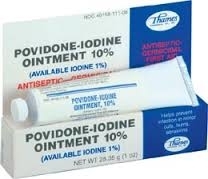 Povidine-iodine can also be formulated as topical antiseptic products. These products are sold over-the-counter and used in hospitals widely. The main purpose for using these is for cleansing and disinfecting the skin, preparing the skin before operation and treating infections susceptible to iodine. Clean the affected area, apply a small amount of this product to the area 1-3 times daily, may be covered with a sterile bandage, if bandaged, let dry first.